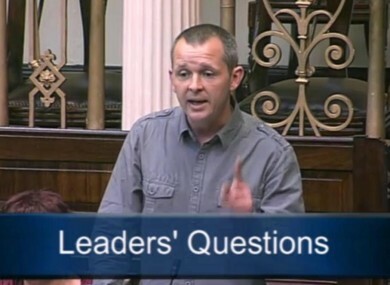 There was some choice language in the Dáil during Leaders’ Questions this morning. THERE WAS EXCITEMENT aplenty at Leaders’ Questions in the Dáil this morning as Tánaiste Eamon Gilmore and Richard Boyd-Barrett came to blows over the Fiscal Compact referendum using some, er, colourful language. As the People Before Profit TD urged the government to abandon the treaty and adopt a “real jobs strategy in Europe”, Gilmore warned of the danger of Ireland ending up like Greece. Later, Boyd-Barrett responded that the Tánaiste’s “fetish for interesting vocabulary such as orgies and arousal” indicated a new theme for the Labour Party and its colleagues in Europe “despite their differences on policies over the fiscal treaty”. Email “Video: Tánaiste and Boyd-Barrett spar over a 'fetish for orgies and arousal' ”. Feedback on “Video: Tánaiste and Boyd-Barrett spar over a 'fetish for orgies and arousal' ”.